Aristotle (Ari for short) is a 15-year-old Mexican American living in Texas in 1987. He’s bored and miserable and pretty much hates his life. Aristotle and Dante meet at the local pool where Dante offers to teach Ari how to swim. “All that summer, we swam and read comics and read books and argued about them.” It’s the beginning of beautiful friendship, something that Ari seems to desperately need. Feeling sorry for myself was an art. I think a part of me liked doing that. Maybe it had something to do with my birth order. You know, I think that was part of it. I didn’t like the fact that I was a pseudo only child. I didn’t know how else to think of myself. I was an only child without actually being one. That sucked. Ari has older twin sisters and an older brother who is in prison. He was born after his father returned from serving in Vietnam. Sometimes I think my father has all these scars. On his heart. In his head. All over. It’s not such an easy thing to be the son of a man who’s been to war. 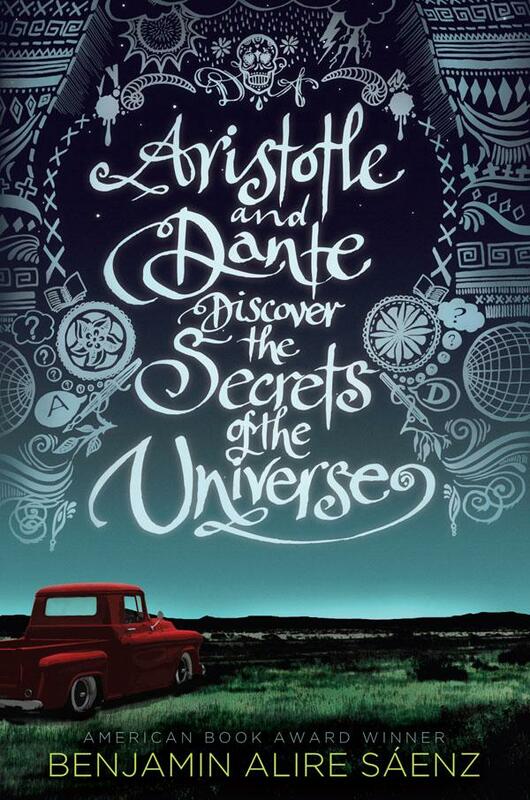 Aristotle and Dante Discover the Secrets of the Universe is a coming of age story. It’s a story about fathers and sons and mothers and sons. It’s about sacrifice and loyalty. It’s a story about friendship. I wanted to tell them that I’d never had a friend, not ever, not a real one. Until Dante. I wanted to tell them that I never knew that people like Dante existed in the world, people who looked at the stars, and knew the mysteries of water, and knew enough to know that birds belonged to the heavens and weren’t meant to be shot down from their graceful flights by mean and stupid boys. I wanted to tell them that he had changed my life and that I would never be the same, not ever. And that somehow it felt like it was Dante who had saved my life and not the other way around. I wanted to tell them that he was the first human being aside from my mother who had ever made me want to talk about the things that scared me. I wanted to tell them so many things and yet I didn’t have the words. So I just stupidly repeated myself. “Dante’s my friend. I was the age of these characters somewhere around 1976. I didn’t know anyone who was gay. Okay, looking back – of course I did, but we didn’t talk about it. It wasn’t acknowledged. As far as I know, they weren’t out. I am profoundly grateful as a teacher and a parent, just as a human being, that books like this exist. Alire Sáenz has written a story about boys who are smart and fragile and flawed. I admit it – I got teary a few times reading this book. This is a beautiful book and I highly recommend it. This entry was posted in Book Chat and tagged 2015, award winner, Book Review, CBC, highly recommended, LGBT, teen, YA by Christie. Bookmark the permalink.